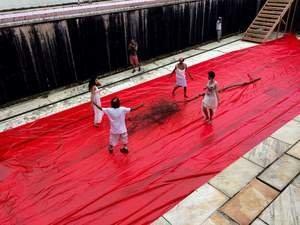 RIO DE JANEIRO, BRAZIL--(Marketwired - Mar 24, 2015) - On Saturday, renowned activist artist Ronald Duarte and Emerging Collective joined forces to create "Gota D'Agua," a site-specific art intervention intended as a call to action in response to Brazil's water crisis. Strategically planned to coincide with UN World Water Day, Gota D'Agua gathered onlookers around an abandoned Olympic size swimming pool at the foot of Edificio Raposo Lopes, a towering luxury condominium building situated on a steep incline overlooking Rio de Janeiro. "Water shortage is an issue that the entire Global South can relate to, but one that is particularly felt in Brazil due to the mix of political corruption, big business priorities, and blowback from rainforest destruction," said Emerging Collective Founder Raj Udeshi. "Not one drop of water left -- next they'll take our blood -- that's the single line that inspired this visual action," said Duarte. "We made a rain ceremony in a disused pool, trying to resurrect a dead tree to make people realize that the loss of the rainforest is the cause of our water problems." For photos and more information on Gota D'Agua, please visit www.emergingcollective.com. Emerging Collective is an NGO which supports artists working at the intersection of activism and the avant-garde. Bridging the First World and Global South divide, Emerging Collective devotes its resources to producing immersive installations that provoke/advance political and social dialogue. Emerging Collective aims to catapult the most promising creatives to the forefront of the global art scene, empowering them to serve as agents of cultural change for future generations.